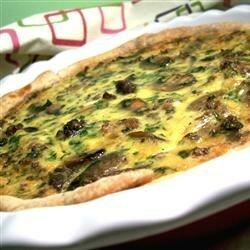 "One of the best quiches I have ever had. Delicious and filling. Also great for dinner." Preheat oven to 400 degrees F (200 degrees C). Prepare the mushrooms by snipping off the stems. Cut in half if large. Crumble the sausage in a large skillet, add the mushrooms, cook on medium-high heat until the meat and mushrooms are lightly browned and all the liquid from the mushrooms has evaporated. Drain off the grease. Add the parsley. In a large bowl, beat the eggs, adding the cream, cheese and salt. Pour into the mushroom/sausage mixture; blending well. Pour mixture into the pie shell. A very good quiche lots of flavor for such few ingredients. It was easy to get done when I got home from work and the family enjoyed it very much. Yum. I had portobello mushrooms on hand which made this even better! Other than that I made pretty much as stated; watching my diet so only had fat-free half and half.